Employment verification is required when you approach a creditor for borrowing some money. The creditor would not provide you money without checking your personal and professional details minutely. It would ask you to show income statements, and at the same time, it will ask you to furnish important employment details. The creditor will verify all these collected data by approaching your employer. In that case, the creditor needs to provide employment verification letter to the employers so that the required information can be gathered or verified. 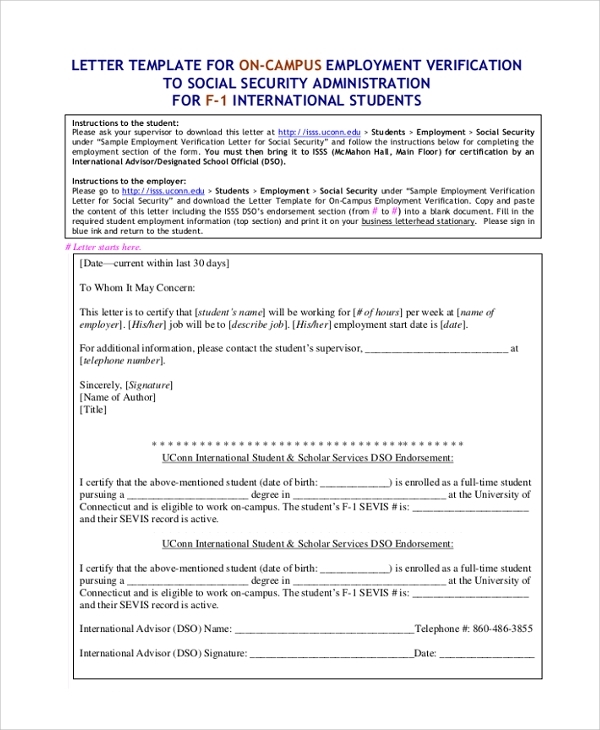 Income verification letter has been written by the potential creditors to check the applicant’s income status for the security of their money. To write such letter, you can simply use this simple and perfectly formatted template. 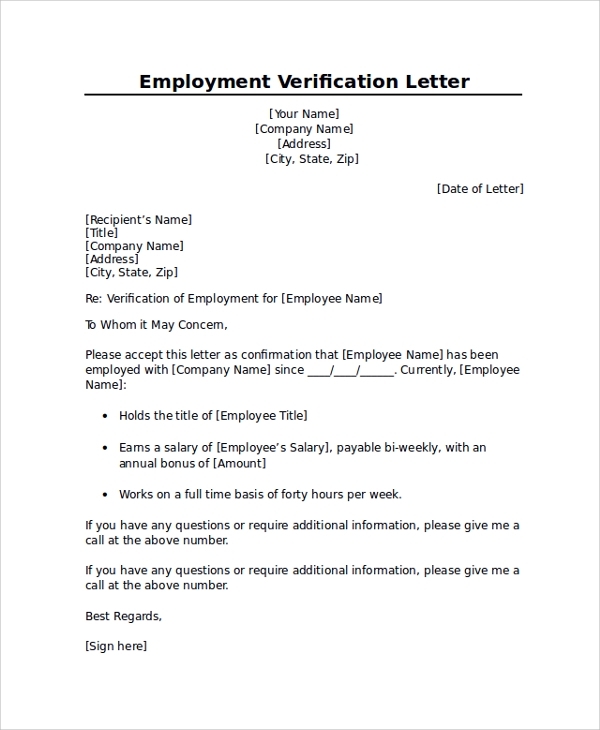 In order to verify the details for employment of a person, it is important to write a formal letter to the employer of that person, asking for information verification. This template is perfectly suitable to be used for his purpose. Self-employed persons also look for borrowing money from lenders at different point of time. In order to check self-employer verification, creditors have to write letters to the appropriate authorities. Create such letter in a few minutes with this online sample. For employment verification, it is imperative to write a seamless letter. The letter should be crafted in professional style, asking for verification of data about the certain employee of the employer. 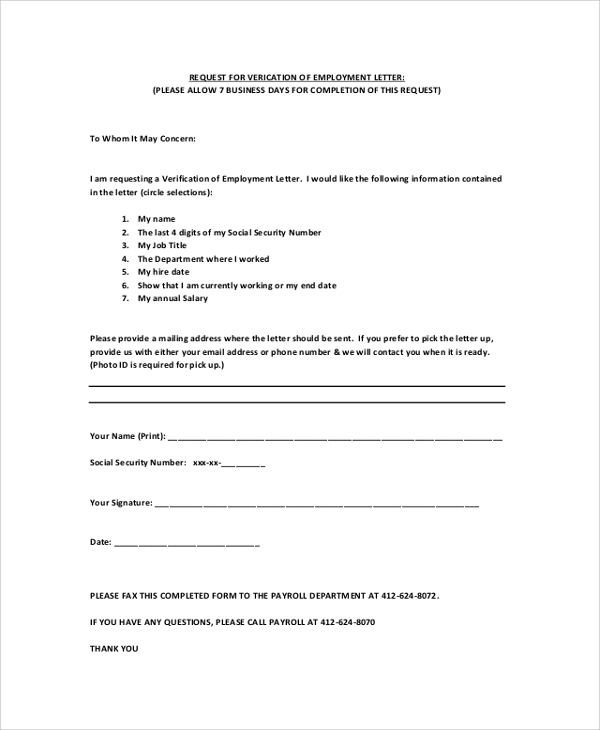 Primarily employment verification letters are used for verifying professional details that have been furnished by the person who is seeking to borrow some money. Creditors need to check the personal and professional details of the person carefully before lending money. It is important for the security of money that it is lending to the applicant. Who Should Write Employment Verification Letter? 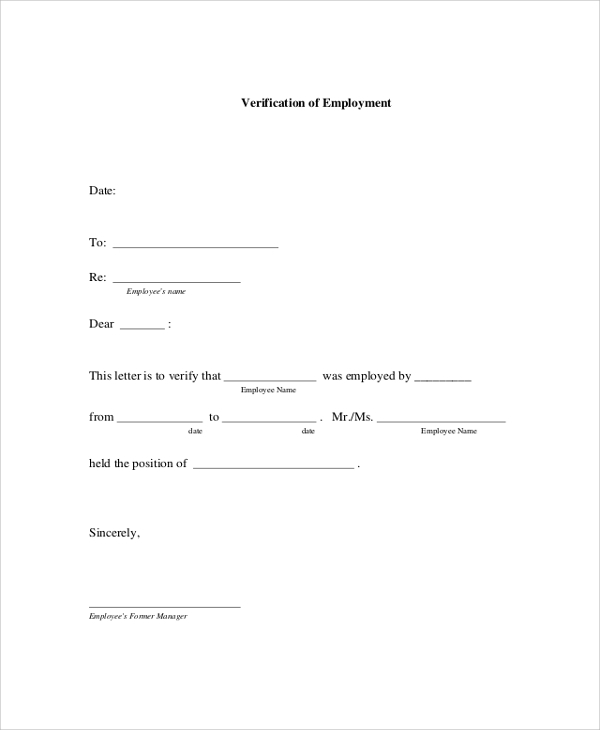 Typically, employment verification letters are written by those, who want to verify a person’s employment details. For example, a person has applied for a personal loan or an expensive stuff on EMI. In such cases, potential lenders check employment details of the person carefully. Checking employment details will help the lender to understand whether the person is suitable for lending or not. It is also a way of checking the authenticity of the borrower. One must furnish accurate details before borrowing money. If details are not accurate, application for a loan will not be granted. 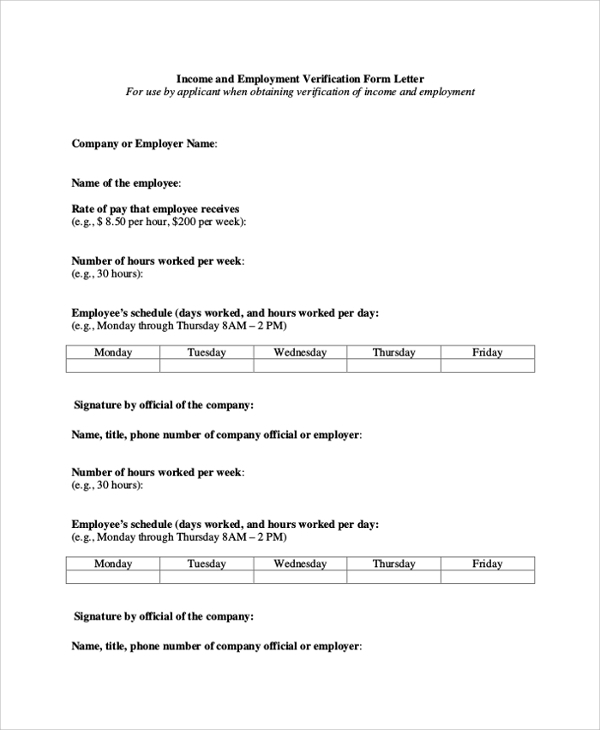 To write employment verification letters, you need to use the online samples or templates. 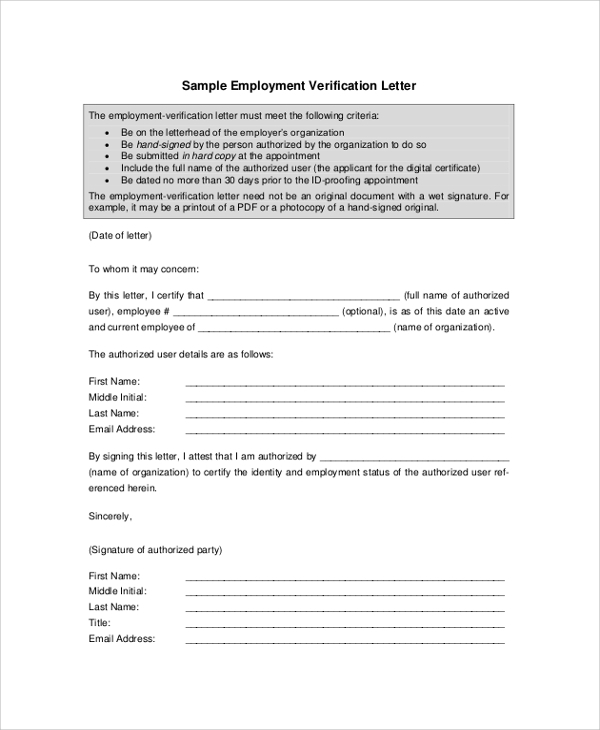 For verification of the employment details of a person or applicant for a loan, using employment verification letter is common. Professional lenders, like banks or other major financial institutions, know how to craft such letters in professional style. But, small lending groups or individual lenders do not know how such letters have to be written. They come up with a poorly written or complicated or confusing letter, which would not get any importance from the receiver of the letter. 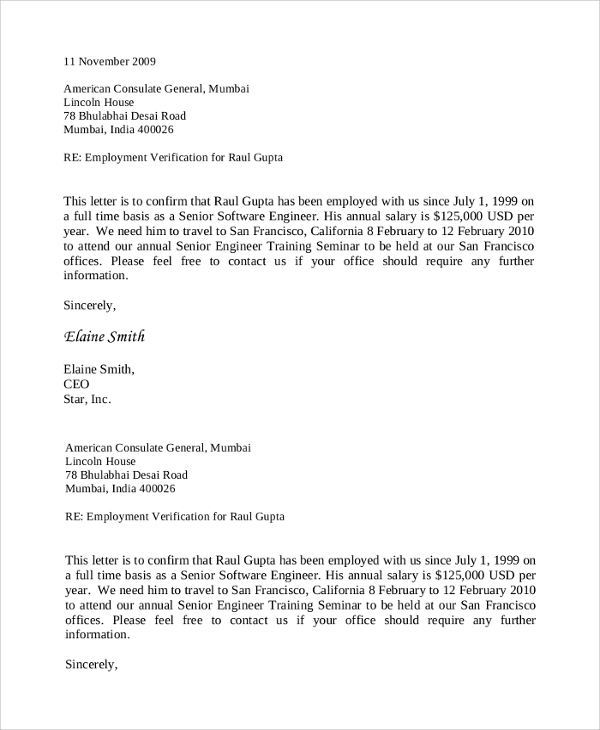 That is why one should use employment letter template for writing Employment Verification Letter in professional style. The tone of writing and format should be perfect for such letters. In order to write job verification letter, using an online sample is considered as the best approach. All you need is download a few samples. Check them and select a suitable one that can serve your purpose neatly. Customize the sample, and print it for using. 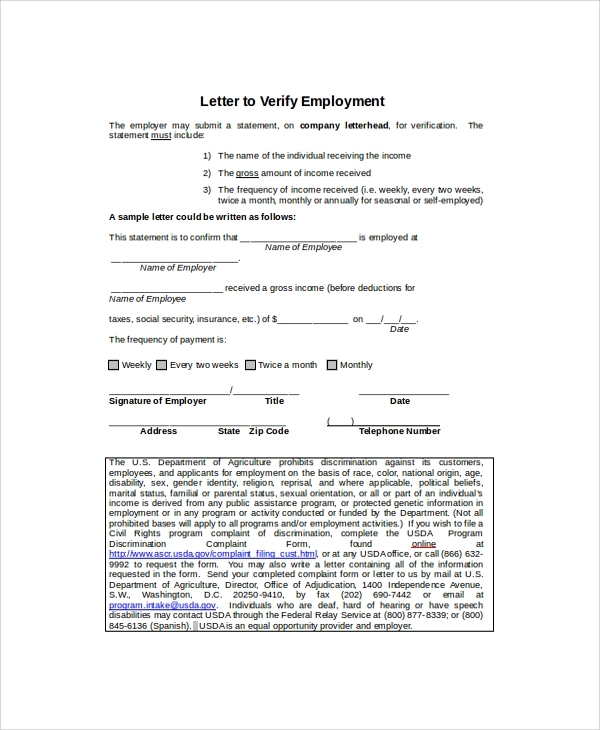 Professional lenders often use online job verification letter samples.